Brenda Densmore (Woodward) has worked as a hydrologist for the USGS Nebraska Water Science Center since 2003 and previously as a student trainee starting in 2001. She has an undergraduate degree in fisheries and wildlife and a graduate degree in Natural Resources with emphasis in Aquatic Ecology, both from the University of Nebraska-Lincoln. She has participated in and lead water-quality and biological monitoring programs as part of the USGS National Water-Quality Assessment Program, EPA’s Environmental Monitoring and Assessment program, and EPA’s National Rivers and Streams Assessment. Brenda has taken the lead on GPS surveying for the Nebraska Water Science Center and has collected and worked with both aerial and tripod-mounted LiDAR. 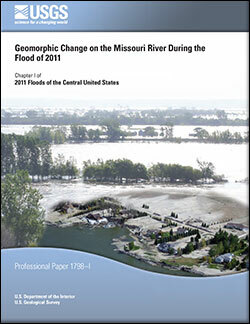 Since early 2007 Brenda has lead several Missouri River surveying projects, which incorporate bathymetric surveying. 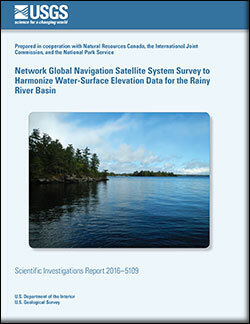 Surveys prior to 2008 were completed using singlebeam echosounding equipment along with GPS and an Acoustic Doppler Current Profiler to measure depth, position, water-surface elevation, and velocity. 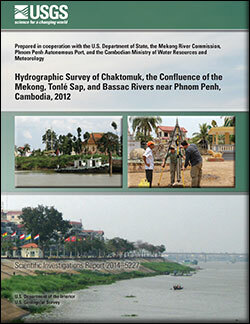 Recently, Brenda and other scientists at the USGS have used a multibeam echosounder to survey the river bed and structures of the Missouri River. 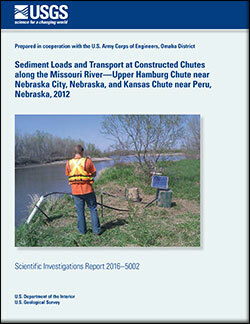 Densmore, Brenda K.; Rus, David L.; Moser, Matthew T.; Hall, Brent M.; Andersen, Michael J.
Densmore, B.K., Rus, D.L., Moser, M.T., Hall, B.M., and Andersen, M.J., 2016, Sediment loads and transport at constructed chutes along the Missouri River—Upper Hamburg chute near Nebraska City, Nebraska, and Kansas chute near Peru, Nebraska, 2012: U.S. Geological Survey Scientific Investigations Report 2016–5002, 47 p. http://dx.doi.org/10.3133/sir20165002. 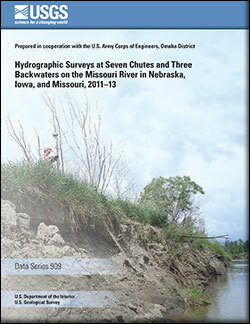 Krahulik, Justin R.; Densmore, Brenda K.; Anderson, Kayla J.; Kavan, Cory L.
Krahulik, J.R., Densmore, B.K., Anderson, K.J., and Kavan, C.L., 2015, Hydrographic surveys at seven chutes and three backwaters on the Missouri River in Nebraska, Iowa, and Missouri, 2011–13: U.S. Geological Survey Data Series 909, 28 p., http://dx.doi.org/10.3133/ds909. 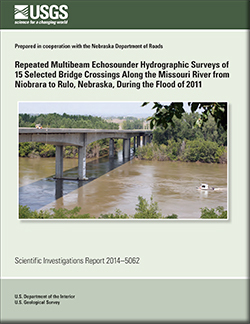 Dietsch, Benjamin J.; Densmore, Brenda K.; Wilson, Richard C.
Dietsch, Benjamin J.; Densmore, Brenda K.; Strauch, Kellan R.
Repeated multibeam echosounder hydrographic surveys of 15 selected bridge crossings along the Missouri River from Niobrara to Rulo, Nebraska, during the flood of 2011; 2014; SIR; 2014-5062; Dietsch, Benjamin J.; Densmore, Brenda K.; Strauch, Kellan R.
Schenk, Edward R.; Skalak, Katherine J.; Benthem, Adam J.; Dietsch, Benjamin J.; Woodward, Brenda K.; Wiche, Gregg J.; Galloway, Joel M.; Nustad, Rochelle A.; Hupp, Cliff R.
Geomorphic change on the Missouri River during the flood of 2011: Chapter I in 2011 Floods of the Central United States; 2014; PP; 1798-I; 2011 Floods of the Central United States (Professional Paper 1798); Schenk, Edward R.; Skalak, Katherine J.; Benthem, Adam J.; Dietsch, Benjamin J.; Woodward, Brenda K.; Wiche, Gregg J.; Galloway, Joel M.; Nustad, Rochelle A.; Hupp, Cliff R.
Densmore, Brenda K.; Burton, Bethany L.; Dietsch, Benjamin J.; Cannia, James C.; Huizinga, Richard J. 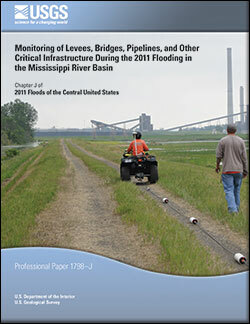 Monitoring of levees, bridges, pipelines, and other critical infrastructure during the 2011 flooding in the Mississippi River Basin: Chapter J in 2011 floods of the central United States; 2014; PP; 1798-J; 2011 floods of the central United States (Professional Paper 1798); Densmore, Brenda K; Burton, Bethany L.; Dietsch, Benjamin J.; Cannia, James C.; Huizinga, Richard J.
Densmore, Brenda K.; Strauch, Kellan R.; Dietsch, Benjamin J.
Hydrographic surveys of the Missouri and Yellowstone Rivers at selected bridges and through Bismarck, North Dakota, during the 2011 flood; 2013; SIR; 2013-5087; Densmore, Brenda K.; Strauch, Kellan R.; Dietsch, Benjamin J.
Galloway, Joel M.; Vecchia, Aldo V.; Vining, Kevin C.; Densmore, Brenda K.; Lundgren, Robert F.
Evaluation of water-quality characteristics and sampling design for streams in North Dakota, 1970–2008; 2012; SIR; 2012-5216; Galloway, Joel M.; Vecchia, Aldo V.; Vining, Kevin C.; Densmore, Brenda K.; Lundgren, Robert F.
Rydlund, Jr., Paul H.; Densmore, Brenda K.
Methods of practice and guidelines for using survey-grade global navigation satellite systems (GNSS) to establish vertical datum in the United States Geological Survey; 2012; TM; 11-D1; Rydlund, Paul H., Jr.; Densmore, Brenda K.